The samovar set includes: "Traditional" wood samovar 7 liters, a tray and a brass pipe with a handle. An excellent solution for giving or as a gift to an expensive person. 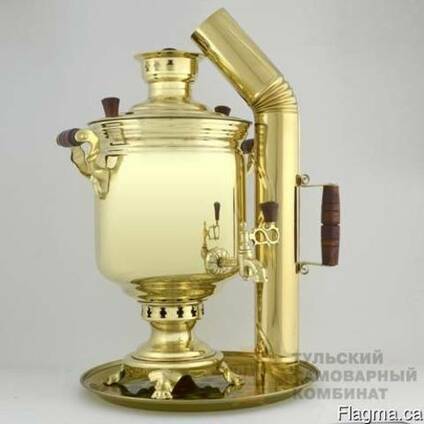 This model of samovar is made of brass at the Tula factory. The case perfectly preserves heat, wooden handles will protect from burns when transporting a melted samovar or using it. To melt the samovar most often use ordinary chips or charcoal, but some are drowned with fir cones. In any case, the tea will turn out delicious and fragrant.